These two offenses violate the very same law. They carry the same potential punishment, which is up to 93 days in Jail, a fine of up to $500 (plus Court costs) for a 1st offense, and up to 1 year in Jail and a fine of up to $1000 (plus Court costs) for a 2nd offense. Beyond adding 2 Points to a Driver’s record, a conviction for DWLS or DWLR also requires a Mandatory Additional License Suspension or Revocation, meaning that the Driver’s License will be Suspended (or Revoked) for an additional period of time just for driving while it was already Suspended or Revoked. Moreover, anyone convicted of either of these offenses will have to pay a Driver Responsibility Fee. 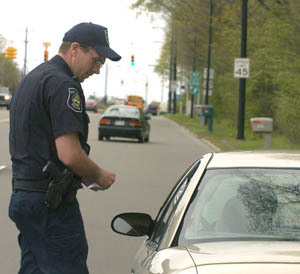 The charge of DWLS arises because someone has had their License Suspended for any of a variety of reasons. Usually, they either have unpaid Traffic Tickets or have outstanding Driver Responsibility Fees owing to the Secretary of State. Many Drivers are unaware that even if they owe the SOS money, they can enter into a payment plan that goes for up to 2 years to pay these fees off. Most Drivers charges with DWLR have had their License taken away due to 2 or more prior DUI or Substance-Abuse related convictions. These Drivers cannot simply have their License “reinstated,” but must apply for a License Restoration once they are eligible for such a hearing. Typically, a person hires a Lawyer for one of these charges to keep them out of Jail and avoid any additional and further term of License Suspension or Revocation. If someone is facing either of these charges, and the case against them is “solid,” I try and negotiate a Plea Bargain which, beyond keeping them out of Jail, will reduce the charge to something called a “No Ops,” or “Failure to Produce a Valid License.” This offense does not carry any Points, nor does it result in any Mandatory Additional Suspension of the Driver’s License. On top of that, there are no Driver Responsibility Fees assessed for a “No Ops.”. It really is a “bargain” in every sense of the word. Working out such a bargain depends, more than anything, on the Driver’s prior record and the City (or Township) where the offense occurred. As a Lawyer who limits his practice to the Metro-Detroit area, I can usually give a Driver who has been charged with one of these offenses in the Detroit area a pretty good idea of what the likely outcome of his or her case will be after just a few questions.